« 6-16-1961 » is a date, just like the one that can be found on the front page of a newspaper giving the date of its release. It is a piece of work that seeks to reflect on the reliability of the information disseminated by the media in its form as well as in its content; that moment when an event, whilst being talked about, becomes a story, which soon finds itself part of History. 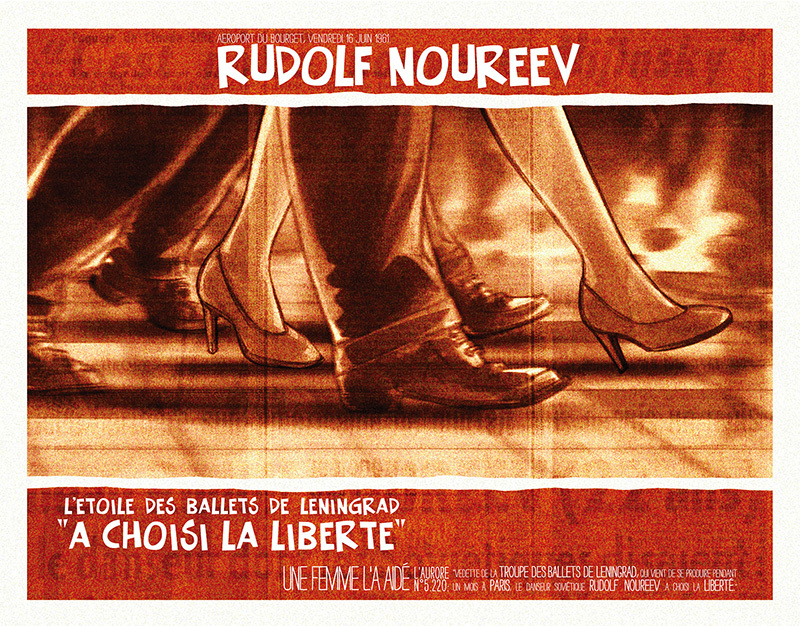 This reflection is based on the defection of Rudolf Nureyev’s Soviet Union, which takes place in Paris on 16 June 1961 at Le Bourget airport. A characteristic feature of this event is the multiplicity of its versions, its narrative lines. After reading the newspapers of the time, different books, and stories, it is ultimately impossible to know how it really happened. For some he jumped majestically, for others he fell hysterically into the arms of the French police. Nureyev has even given, in an interview in the 90s, a totally different version from the biography that was released in 1962. According to the 1990s version, after hiding behind one of the poles in the hall of the airport, he would have patiently waited for the KGB men responsible for his surveillance to disappear as if by magic, and would have walked calmly towards the French police to seek asylum. Nevertheless, in order to be part of History, the event has to be told. It is this narrative line that gives an aesthetic form to a particular event and turns it into a story, which can then be integrated into History. Even if the event was not a major event of the Cold War it has all the characteristic flavor of a scene from a movie of the time. The suspense is « Hitchcockian » and so are the protagonists. The hero is overwhelmed and must take a decision, the impossible situation, and the young lady who would do anything to save him. 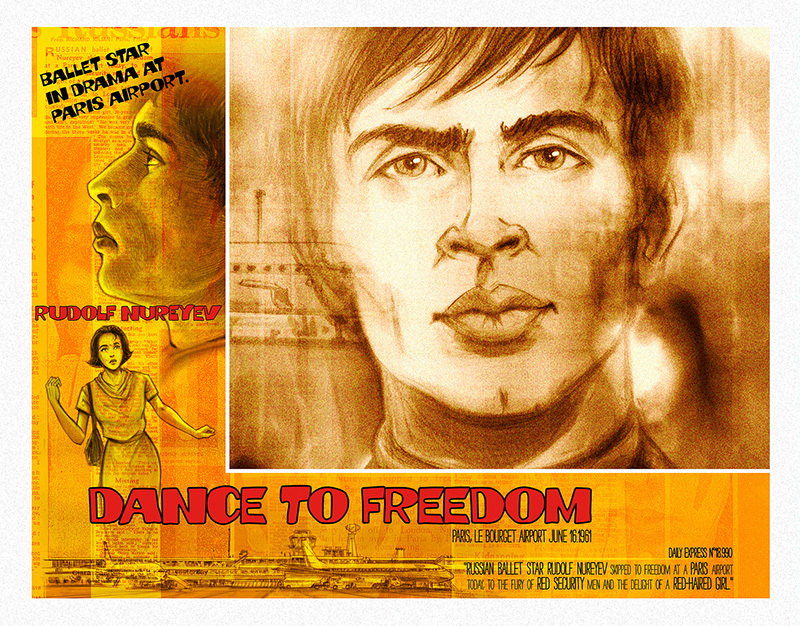 The only thing we can be sure of, is that Nureyev claimed for a freedom that will allow him to keep going on practicing his art the way he wants. A short movie, using a basic animation which is known as ‘animatic’ in the advertising and cinema industry. An ‘animatic’ is a preliminary form of a commercial or a movie sequence, consisting of a series of drawings of the key moments of the action. In the same way as a storyboard, it is used to set a story, its issues, and to establish what will be shot after. 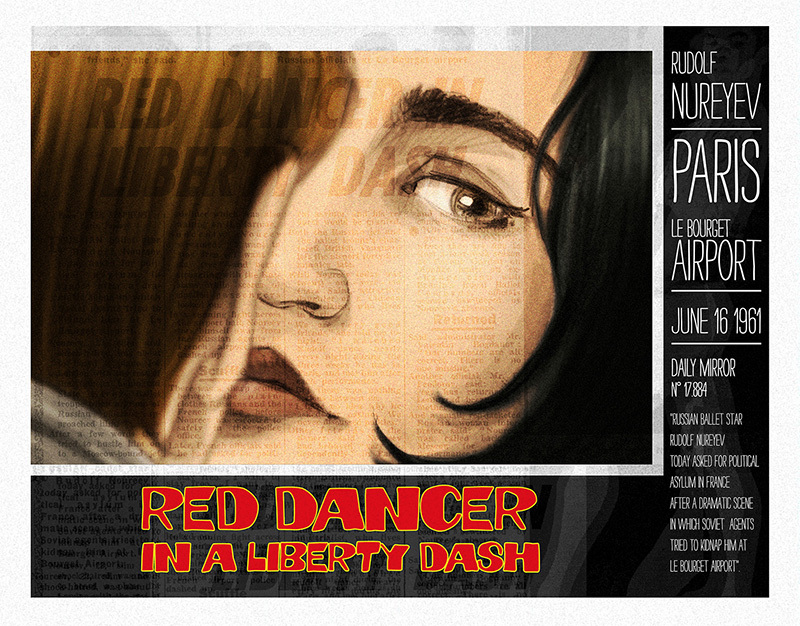 In our case, this animatic is presented as a preliminary draft of a trailer, a film that was never shot, that no one has ever seen. Each viewer is therefore able to imagine his own version. It is the legend of the Nureyev defection to the West that we will attempt to study with a movie consisting of a very wide screen, split into 3 screens showing 3 different versions of the event. The Lobby-cards are the photos of the movie displayed in the lobbies of the cinemas. They are one of the marketing elements used to promote the movie. Generally a lobby card is composed of a photo of the movie surrounded by the title of the movie, credits and sometimes logos or special designs that refer to the movie. In these 3 series, inspired by the design of Alfred Hitchcock lobby cards of the 60s, the texts are replaced by headlines and samples of the newspapers of that day. The articles are overprinted with the aim to suggest a vibration, a noise, a buzz in which nothing can be clearly heard. Ultimately the project aims to recount an event, not simply as a piece of information, but as a story, and therefore as entertainment.